now available for download at $4.99 on AudioSeaStories. When they moved aboard Nine of Cups in 2000, Dave and Marcie Lynn dreamed of sailing off to as many far away places as they could. Since then, they have spent time in some pretty amazing and remote locations and learned right away that the learning curve for their new way of life is steep. A case in point is the art of anchoring. Dave and Marcie learned that what works well in Narragansett Bay isn't always the best approach when anchoring in the heavy kelp and deep anchorages of Tierra del Fuego, the coral atolls of the South Pacific, the deep grass and hard sand of the south coast of Australia, the muddy rivers of Panama, or even the Florida Keys. How do you deploy two bow anchors? When is it best to use a stern anchor? How do you rig anchors in series and why? What the heck are snubbers and kellets and how do you use them? How do you pick an anchorage to weather an approaching storm and how do you prepare for it? Much of their accumulated knowledge was gained by talking with and observing the many cruisers, voyagers, yachties, and fishermen they met in their travels. As they learned a new anchoring technique, they worked out the bugs and streamlined the operation. While improving their own anchoring techniques, they admit that they made mistakes . . . lots of them. 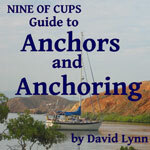 Now, 14 years later, they've collected what they've learned in a new ebook, Nine of Cups Guide to Anchors and Anchoring. It covers everything from selecting the right ground tackle for your boat and your cruising plans to how you go about deploying a series anchor. If you are just starting out as they were in 2000, this book will make the learning curve a lot less steep and help you avoid some of the early mistakes Dave and Marcie made. If you're an experienced cruiser, there's still a great deal of useful information for you. Download your copy of Nine of Cups Caribbean Stories on AudioSeaStories from our server to your tablet with lightning speed.